Posted on June 6, 2013 by Virginia Posted in 2013, Family, Nostalgic, Throwback Thursday	. Here’s another throwback Thursday. Since the summer days are fast approaching, it seems appropriate to share a photo of “going up to the country” from many years ago. Roasting marshmallows with my brother and little cousin Megan. My parents have a summer home on a pond off of the Salmonear Line (AKA the Irish Loop). And since I was around nine years old, it’s been the go-to place for our immediate family on weekends during the summer months. Traditionally, we normally opened (de-winterized) the place on the 24th of May weekend and would close for the winter on Canadian Thanksgiving weekend. In the background of this photo you can see the trailer we originally stayed in. It’s one of those old school tin can trailers; the one that looks like a giant toaster. 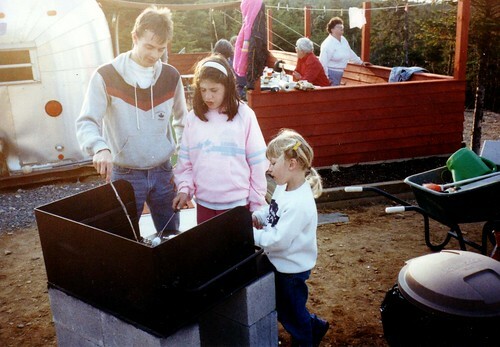 We started off with simple things like a generator, water in barrels and propane for heating and cooking. But in time my father built a house on our land that includes electricity and water coming from a well. Bull Pond is a second home for me and I love being there as much as possible. Of course during my teenage years, I went through that phase of “I’m bored, there’s nothing to do here.” But it didn’t last too long.